Two years after anti-mining activist Sikhosiphi “Bazooka” Rhadebe was gunned down on the Wild Coast, the police investigation into his murder appears to have gone nowhere. Now his family and attorneys have made startling claims that the murder investigation has been bungled or “intentionally impeded” by senior police officials – and they have demanded that the NPA take charge of the investigation before the evidence trail runs stone cold. By TONY CARNIE. While gamblers were busy trying their luck on the slot machines and card tables at the Wild Coast Sun Casino, two gunmen drew up at the nearby home of Sikhosiphi “Bazooka” Radebe on 22 March, 2016, and murdered him in front of his 15-year-old son. The two killers – both posing as policemen – were driving a VW Polo that had been hijacked hours earlier (and while Radebe was being beaten up and shot, the two terrified victims were allegedly huddled in the car – one in the boot, the other on the back seat). Rhadebe, a prominent taxi-owner and founder of a soccer club for unemployed youngsters, was also a vocal opponent of plans by an Australian-led venture to mine heavy minerals from coastal sand dunes along the Xolobeni section of the Wild Coast. The 51-year-old community leader was chairman of the local Amadiba Crisis Committee, which has been at the forefront of opposition to the dune-mining plan by Perth-based Mineral Resources Commodities (MRC) and local empowerment partners. The hijacked car used by the killers was abandoned soon afterwards on a banana farm near Shelley Beach in KwaZulu-Natal. But remarkably, claim Rhadebe’s family, the hijacked vehicle was released from the police pound in Port Shepstone within 48 hours – without any forensic examination of the vehicle – while the two hijack victims were not “properly interviewed” about what they saw or heard as Rhadebe was being murdered. The family claim that senior officers at Mzamba tried to block a private forensic pathologist from attending the post-mortem examination, refused to allow X-ray investigations and then failed to interview several key witnesses and informants timeously who could have helped to track down the hit men. They also claim that it took months for police to examine Rhadebe’s cellphone device, data and call records – and that when the cellphone was finally returned, crucial data appeared to have been deleted. On the recommendation of activist Elinor Sisulu, the family has also engaged two former senior police investigators to probe the murder and both had expressed deep frustration over the SAPS investigation. Now Rhadebe’s angry and distraught family and fellow anti-mining activists have demanded that the National Prosecuting Authority step in to ensure that the SA Police Directorate for Priority Crimes (Hawks) does its job properly. On 22 March, the second anniversary of his death, the family sent an appeal to NPA head Shaun Abrahams and acting Hawks head Yolisa Matakata, demanding that they intervene as a matter of urgency. They also sent a detailed report by the Alternative Information and Development Centre, containing serious criticism of the police probe. The family attorneys, Richard Spoor Inc, said this report detailed the “repeated inadequacies and delays in the investigation by the SAPS and the Hawks over the past two years”. “There are strong suggestions that the investigation has been intentionally impeded. At best, the investigation has been given insufficient attention and resources,” said Spoor Inc attorney Johan Lorenzen. If there was no immediate and discernible progress in the investigations “our instructions are to demand the holding of an inquest into the murder of Mr Rhadebe, at which the multiple obstructions and shortcomings in the investigation will be examined”. On Thursday night spokesmen for NPA and Hawks had not responded to email and telephone requests for comment sent by Daily Maverick earlier in the day. Contacted by cellphone, Hawks spokesman Brigadier Hangwani Mulaudzi said he understood that the Rhadebe family had been “given an update” on the murder investigation, and undertook to respond to the query shortly. NPA spokesman Luvuyo Mfaku could not be reached on his cellphone. Mineral Resources Commodities, an Australian company, says it has pulled out of the mining venture. 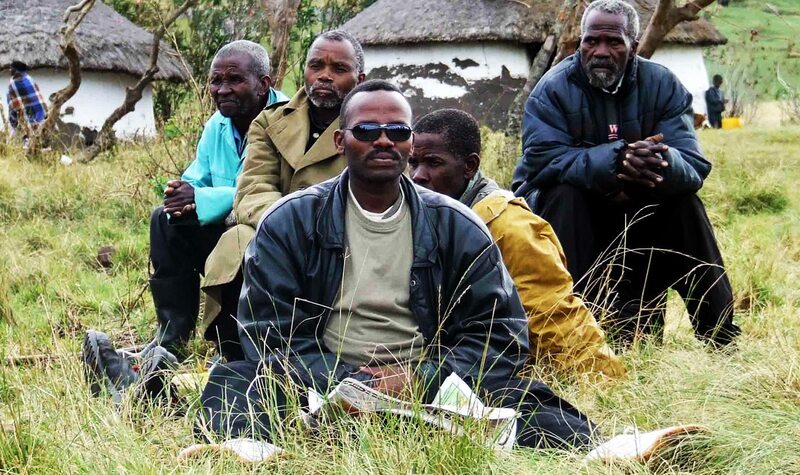 Four months after Rhadebe was murdered, the company announced its decision to divest its majority interest in the controversial dune-mining venture because of “ongoing violence and threats to the peace and harmony of the Xolobeni community” and hoped to sell its interests to a local black economic empowerment group. The Rhadebe family and Amadiba Crisis Committee, however, say they are determined that the full reasons for Bazooka Rhadebe’s murder must be brought to light. In the report prepared by the Alternative Information and Development Centre, Rhadebe’s fellow activists claim that a “death list” was prepared by unnamed parties who had an interest in ensuring that the mining venture went ahead. According to the report sent to the NPA on Thursday, fellow crisis committee member Nonhle Mbuthuma was warned shortly before Radebe was murdered that she was on the hit list. Mbuthuma said Rhadebe phoned her about an hour earlier to warn her to be careful “because they are planning to kill us”. Lorenzen said that two years on not a single arrest had been made, while the family had not received regular feedback on the police investigation. The report also contains the name of at least one person believed to be a prime suspect, but this name has been redacted by family attorneys in an effort not to jeopardise future investigations. It claims that two days after the murder, a Warrant Officer from Mzamba police station tried to prevent the family’s forensic specialists from taking part in the autopsy of Rhadebe’s body. “On 29 March, the SAPS continued to oppose our clients’ specialists from taking part in the autopsy. On 30 March the (Hawks) in Bizana failed to honour an agreement to investigate the scene of the crime together with the ballistics specialist appointed by our clients, claiming that they did not have transport from Bizana to the crime scene. “They also failed to honour an appointment to inspect the hijacked vehicle used in the murder at the SAPS vehicle pound in Port Shepstone. We learned that the vehicle had been released by the SAPS days earlier. “After breaching an agreement to jointly download the data from Mr Rhadebe’s cellphone, the (Hawks) processed the phone itself. In August, a police brigadier had suggested that “all indications are that the killing was a result of a feud in the Mzamba Taxi Association and that it is not a result of the mining dispute”. “Our clients had information to the contrary and engaged a private investigative organisation, The iFirm. The iFirm is led by former SAPS Generals T Ntobela and M Petros. It started its investigation on 3 September 2016. The report says senior officials later undertook to transfer the murder docket to a police brigadier based in East London, and then later to a senior Hawks officer in KwaZulu-Natal. This allegedly happened after an Eastern Cape police major allegedly commented, “What is so special about this case?” and asserted that “people die every day”. Private investigators later submitted a report suggesting that “the non co-operation of the SAPS members made this investigation an impossible mission” and that the Hawks “would have solved this case a long time ago if they were willing to do so”.